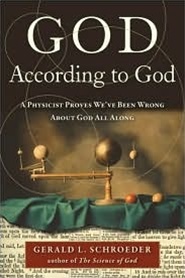 In this groundbreaking exploration, a biblical scholar and M.I.T.-trained physicist combines decades of research to change the debate between religion and science, presenting a new paradigm of how to understand God. Gerald Schroeder has spent his career revealing the hand of God in the intricate discoveries of physics. Now, for the first time, he turns his attention to this force, examining both the Bible and the physical world to discover the true nature of God—God according to God. Schroeder argues that we have ignored those traits of God we find unappealing, replacing them with our personal desire for the all-knowing, all-loving, never-changing deity that so many worship today. This leads to the age-old problem: How can there be such a God when the world is filled with tragedy? Yet Schroeder reveals that this troubling juxtaposition is really smoke and mirrors. The God revealed in the Bible is 100 percent compatible with the world as we know it today. It is our misconception of God that causes the disparity. In fact, the concept of God that atheists rail against and that believers defend is inaccurate. In God According to God, Schroeder presents a compelling case for the true God, a dynamic God who is still learning how to relate to creation. The key to God's action in the world, according to Schroeder, can be found in a well-known verse in Exodus that is typically translated "I am that which I am." Schroeder's correction that it should be translated "I will be that which I will be" reveals a God that changes to fit the ever-changing world. This opens our eyes to other characteristics of God that we have long overlooked despite theirbeing present in some of the most popular stories in the Bible—a God who regrets (the flood of Noah), a God who wants us to argue with Him (Jacob wrestling with God in the desert), and thus a God who changes His mind (Moses convinces God to spare the Israelite people), and a God who allowed nature, and the creation itself, from the very start, to rebel (Adam's and Eve's betrayal in Eden). With riveting chapters on the origins of life, a scientist's view of creation, and the unique place of our planet in the galaxy, God According to God offers a radical paradigm shift that will forever change how we understand God.